My friend Noeleen,snarling on her birthday and wearing a photo of herself snarling at a previous birthday.PS: I’ll have you know, Noeleen authorized the public distribution of the photo above in exchange for my bringing coca cola cake to her boyfriend’s NYE party…!!BARGAIN!! There is never a bad occasion. Never. 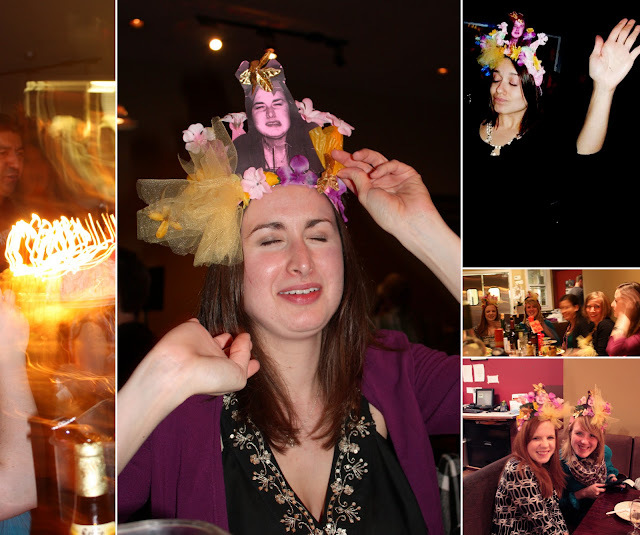 And I’m not just talking about kid’s parties either; adults enjoy part hats just as much, if not more! Well, maybe not all adults. Maybe just the cool ones. The nice thing about party hats is they lend a sense of occasion to any location. When my friend Noeleen had her birthday party at a restaurant last summer, decorations weren’t really an option. Too much fuss. 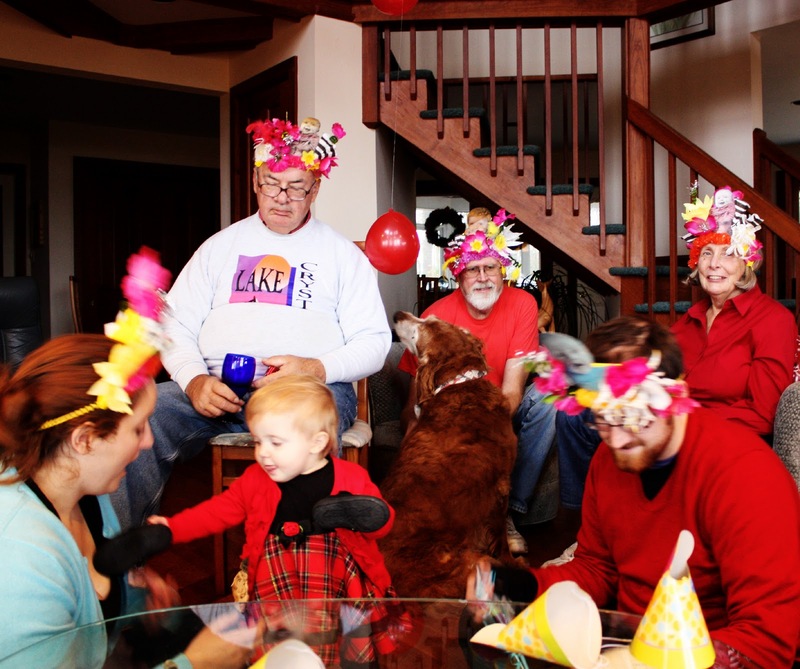 So, we brought the party to the table and wore the decorations on our heads. So what if the other tables looked at us funny? Fun was had by all! 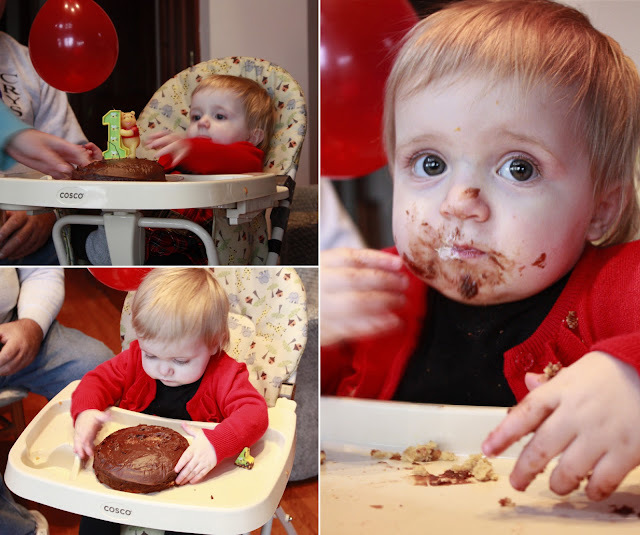 Not long ago I was down South celebrating Abigail’s first birthday. Of course, there needed to be custom hats. And of course, everyone wore one except Abigail. Apparently, baby does not like anything touching her head, not even a custom party hat! Oh well, she had plenty of fun looking at all the adults looking like goofy Carmen Miranda types. As long as we are on the subject of Abigail’s’ birthday, can we all just take a moment to admire my niece? I mean seriously. Just look at that pudding face! 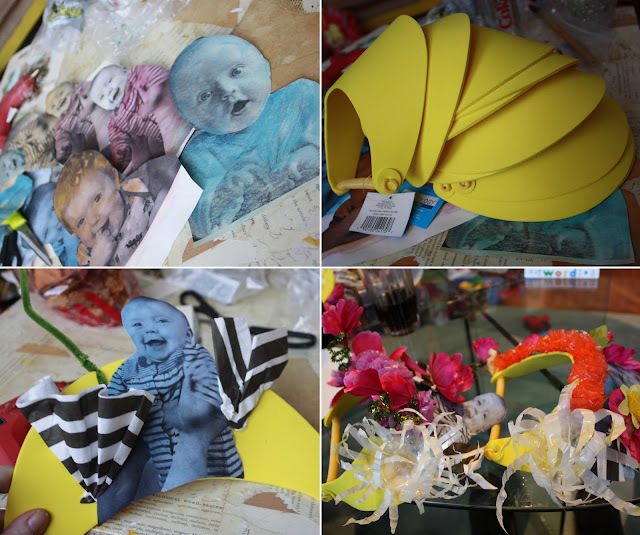 There are lots of ways to make custom party hats, but I find the easiest, sturdiest, and least expensive bases are those latex foam visors you find at craft stores. I try to stock up when they are on sale, buying a bag of ten for $4.00 or so. 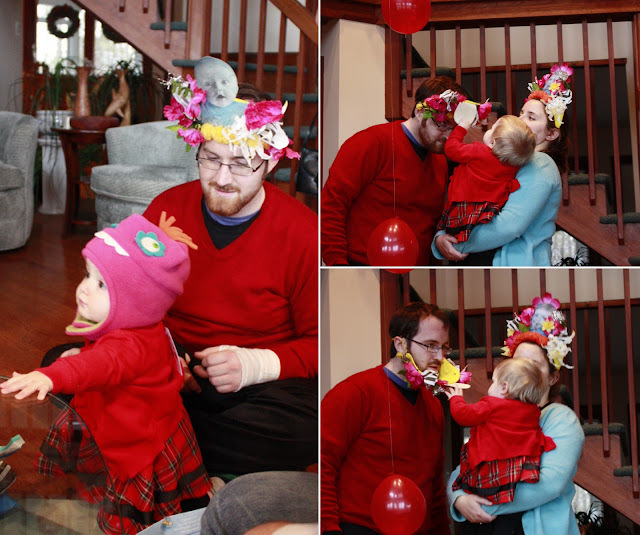 You can also use disposable paper party tiaras from earlier parties, or anything that will sit securely on the head. 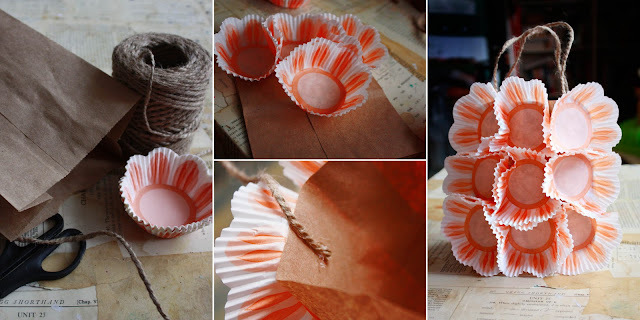 I have even used paper cups in the past….just make due with what you have. Embellishments are unlimited! The secret is to find one or two lightweight elements that take up a lot of space + one or two sparkly/unique elements that will stick out from the pack. The foam rubber is especially nice because you can piece it with pipe cleaners or silk flowers, but glue and duct tape will also get the job done. Just about anything in your waste bin that doesn’t smell or stick to your show can be used to make nifty hats! PS: Just as I was about to post this, I saw this wonderful article from Tatertots & Jello featuring 20 fabulous party hats. Check it out! Bubba, Kerry and Abigail celebrate the day in style! Abigail was fascinated by all the adults wearing hats on her birthday, but they only one she would put on her own head that day was the pink monster (a gift from Uncle John). Kerry took the party hats home afterwards –she thinks they will come in handy in the doctor’s office. Can’t you just imagine your childhood doctor administering shots in a kickbutt hat like this?! I never claimed to have good taste. But listen y’all, it’s Chanukah, and if I want to remember the miracle of the Maccabees through a something four-legged, spangled and fabulous, well, I’m dang-well going to do it! 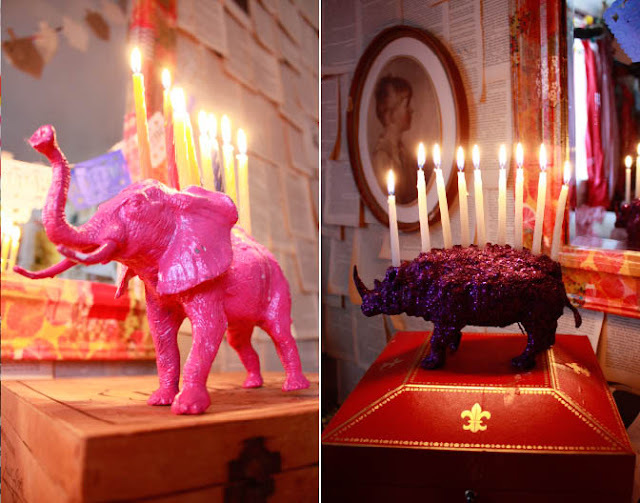 The pink elephant came about a few years ago following a long night of Disney’s Dumbo, good gin and too many Velvet Underground albums. It’s not unusual for me to messing around with terra cotta clay late at night, and that particular night, when inspiration struck, I saw the elephant on my kitchen counter…and boom! A menorah was born. They are easy to make. It’s just a toy + clay + paint/glitter/fancy-top-coat-of-your-choice. Honest. That’s it. If you are thinking hey, maybe I could make that then that’s a good sign you should have made one already. Lay some clay on the animal’s back. Stick some candles in the clay. Dry time will vary depending on density and humidity levels, but I would allow a good 24 hours at least. Tip: All clay will expand and contract as it dries, so leave the candles in the clay so you can be sure they will fit later. Tip: If you have a hard time blending the spots where the clay ends and toy body starts, dribble on some white glue. That’ll patch it up. Tip: Glitter in two coats with two shades of the same color glitter –it will look sparkly and decadant, as well as eliminate any annoying glitter shedding. 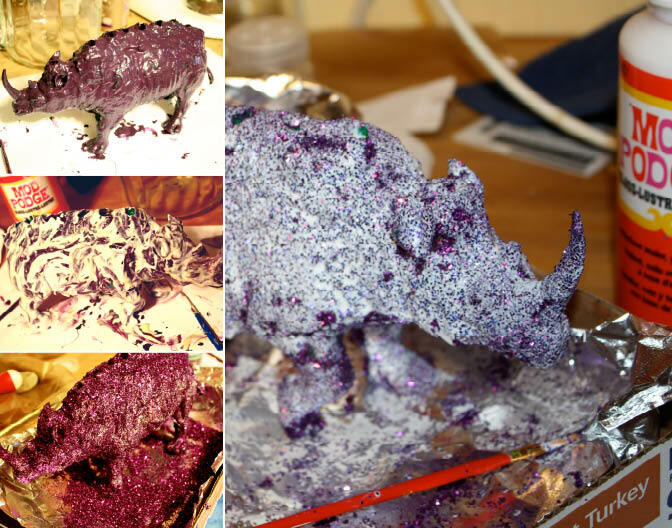 Coat 1: Slather your creature with glue and liberally apply glitter. Dry. Coat 2: Mix together equal parts glue, water, glitter in a shade slightly different than the first coat, and paint the mixture all over. Dry 24 hours. Tip: Don’t leave candles burning unattended. Do really need me to tell you this? If you are reading this, you should know this already. If you don’t know this, then skip this project. You should be spending more time on fire safety than craft time. Tip: Don’t freak out about wax drippings. You spent $2 on making this. 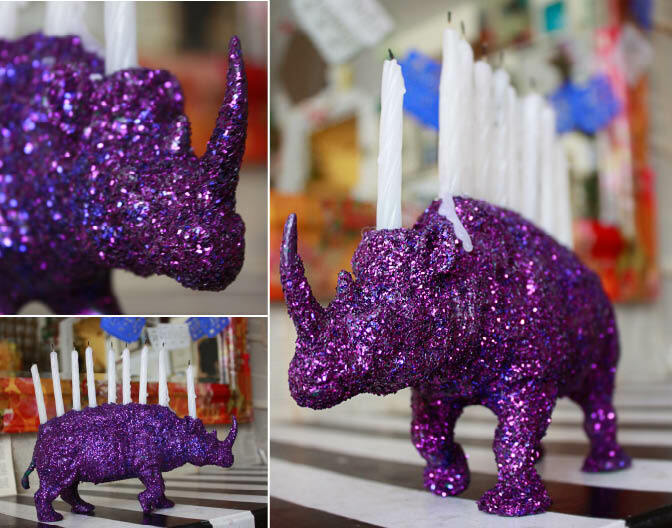 It’s not your grandmother’s menorah; it’s a glittered circus animal. If you really want to remove any potential drippings, you can dip the hole thing in hot water for 5 seconds and it will release in a jiffy. Relax, Max. Tip: Display your finished menorah in front of a mirror. Reflected candlelight is ridonkulously beautiful. Tip: You still here? What are you waiting for? Get started! High winds and a recent cold snap have ruffled up the bark on my neighborhood birch trees. It’s gorgeous. I can’t get enough of it. 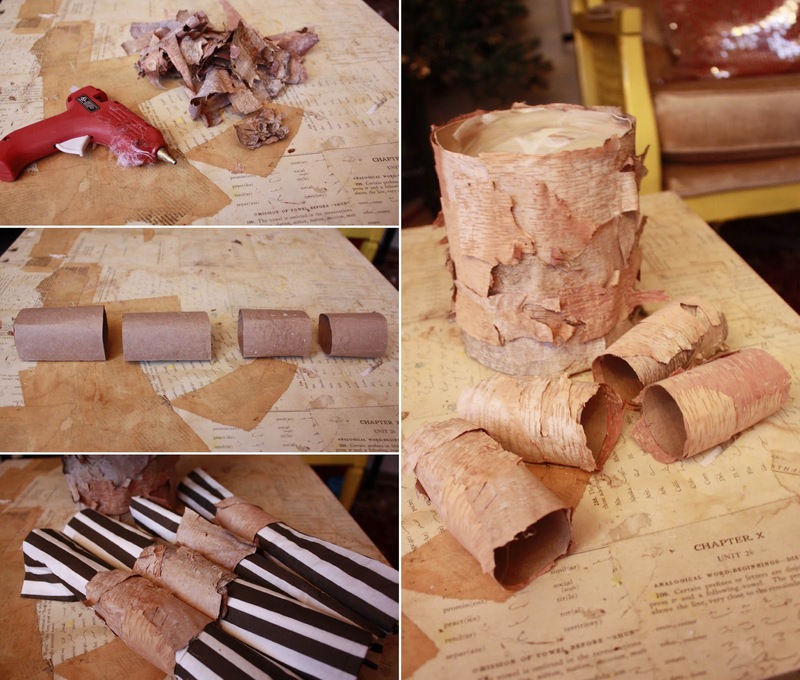 In addition to grocery lists, birch bark can be a great material for making art projects or dressing up your table. 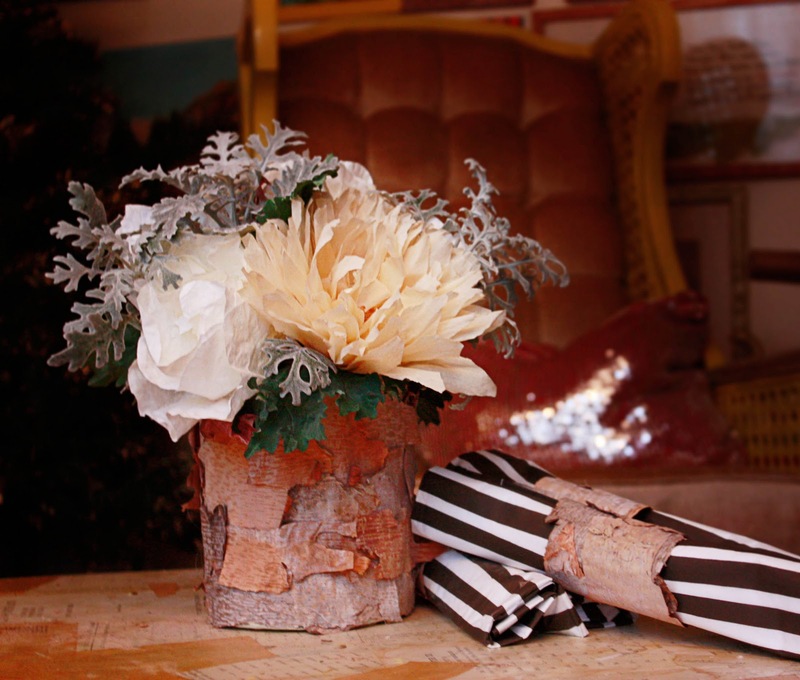 Here, I just hot glued to an empty ice cream bucket and Ta Da it’s a rustic vase for a Thanksgiving centerpiece! Or glue on to cardboard paper towel tubes and you have some nifty new napkin rings. What about pictures frames? Or candle sticks? Or Christmas ornaments? The possibilities are endless! Remember: Only grab the loose bark off the birch trees. Don’t damage the tree by leaving big bald patches all over the trunk. That’s not nice! Tip: Birch bark carry dust and teensy weensy bugs. Generally nothing to worry about, but if you are going to use it on something used near food service, I suggest you dunk your loose bark pieces in a big bowl of water with a cap full of bleach, then let it dry out before gluing to your surface container. I used this all over a table service a few years ago and never noticed a problem, but you can never be too safe with it comes to tree critters. 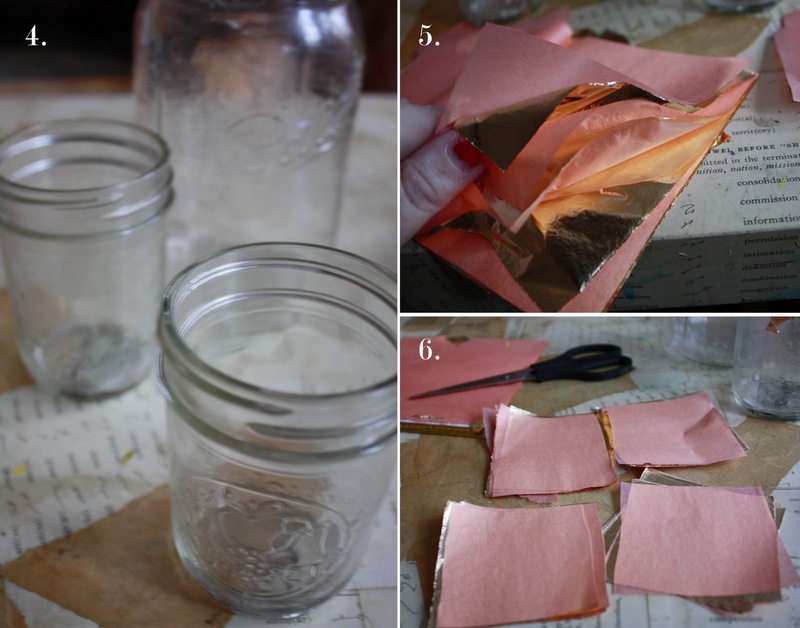 Tip: Birch bark will eventually dry out and crack. To enfuse durability, soak your part pieces in a mixture of 3 parts water to 1 part Mod Podge (matt finish) or Acrylic Matt Medium for 1 hour, then use regular white glue to adhere to your your base. It’s messy but that sucker will last for years! Wine bottle + paper towel tube + plastic forks + rag scraps + glue + glitter = Happy Chanuakkah Y’all! 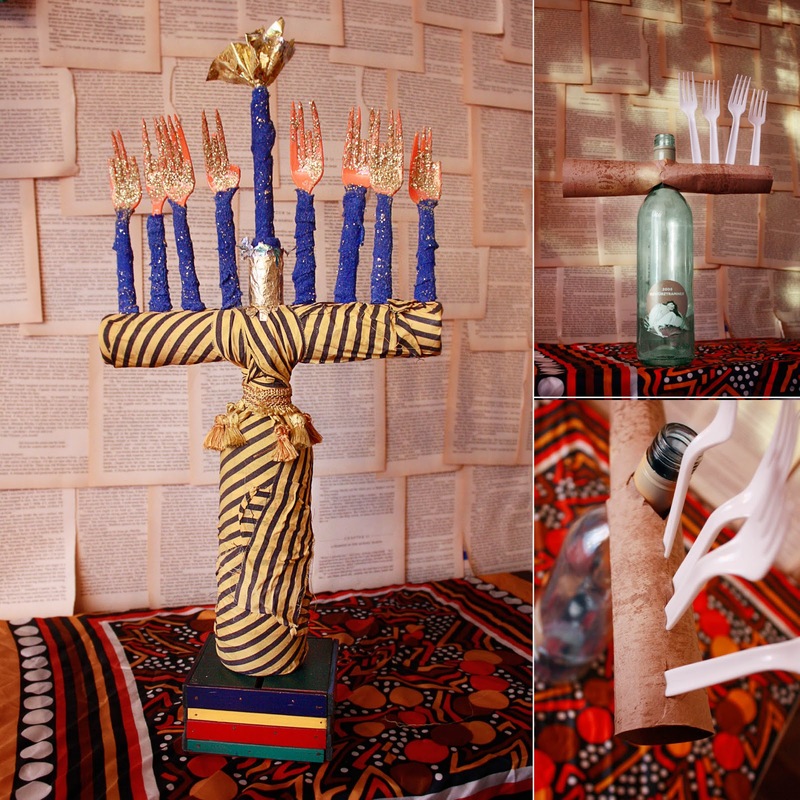 For an old wine bottle and paper towel tube, this menorah is pretty darn snazzy, not to mention ancient. * If that statement is controversial enough to get your girdle in a bunch, you should probably stop reading this before I get to the corn husk angels and Baby Jesus in a walnut shell. GASP! Even back then it was unusual for a public school teacher to encourage kids to make religious objects, but Ms. Finson wouldn’t hear of it. She was 24, fresh out of the peace corps and didn’t take crap from anyone. She was a devout Christian, raised by Baptist missionaries in Equador and could quote the bible like it was a party game. She wore embroidered vests and let us listen to Marvin Gaye music at lunch time. She was cool. Regardless of her own faith, she recognized there were a couple Jewish kids in the class who felt a little neglected around the holidays. It’s not like anyone complained, but after all the years of making mangers and angel ornaments, Ms. Finson recognized the need for change. Diversity is a good thing. Lo, the wine bottle menorah was born! Parents gave her flack. They didn’t like their kids making other people’s religious symbols or taking empty booze bottles on the school bus. Good arguments, to be sure, but Ms. Finson shut them up right quick by quoting some bible passage about Jesus celebrating Chanuakkah with a menorah and wine and spicy velveta dip or some business like that. I don’t really remember. All I know is that I made two mental notes; 1. Jesus was Jewish, and 2. Adults are far too easily impressed by people who can directly quote fancy words from fancy books. Guess that’s why attorneys get paid so much. I could make a lawyer joke right now, but in the spirit if the season, I’ll pass. If you want to make a wine bottle menorah of your own, just make some holes and slits in a paper towel tube and insert it over the neck of a wine bottle. As I recall, we covered the hole thing with scraps from a rag bag dipped in starch (I think this lovely striped piece was a man’s shirt at one point). The forks were originally cafeteria sporks with red tissue paper, but they got lost years ago and are now been replaced with glittered orange forks. 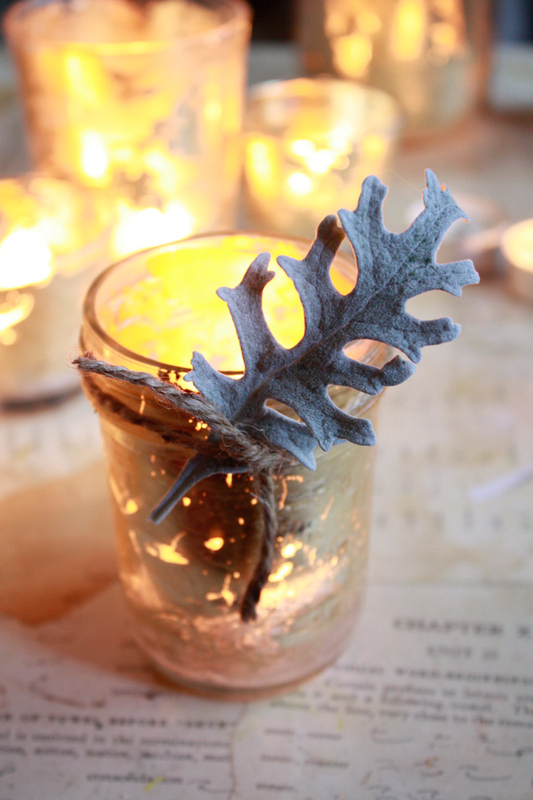 The forks can be inserted and removed same as real candles. The shamash in the middle is inserted in a cork. Easy peazy and it stores nicely. School crafts usually fall apart or get thrown out with January garbage, but this one is a keeper. Its been on display right next to an expensive store-bought menorah that no one ever notices…everyone asks about this menorah. Where did it come from? How did you make it? Can I play with the forks? Kids and adults enjoy it equally. I enjoy it too. I love it. It’s my favorite. Aren’t these pretty? Cheap and easy too. 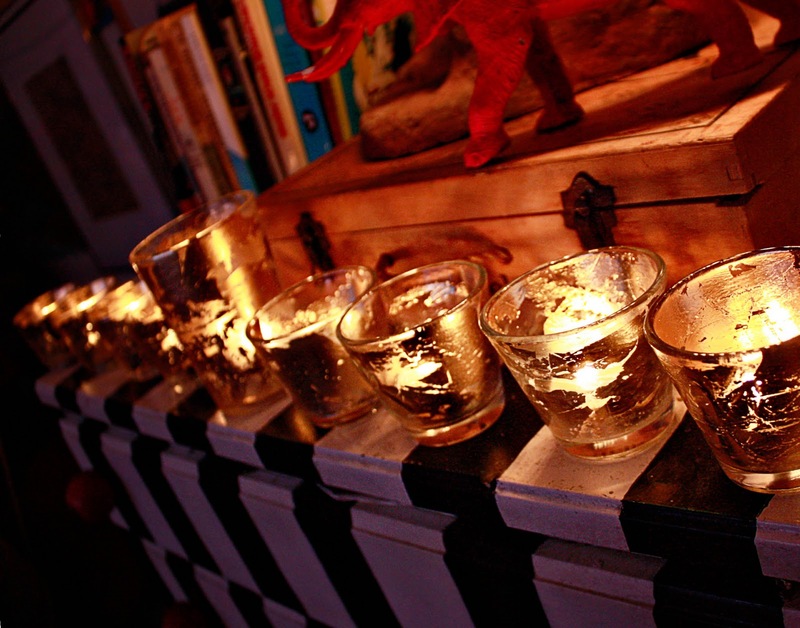 There is something truly magical about candlelight reflecting off real gold. 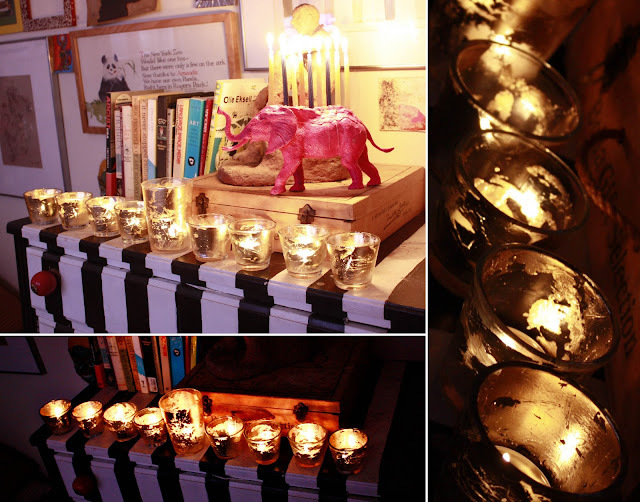 It illuminates with a different, special sort of radiant warmth. Magic like. If you have ever attended a candlelight mass at an old Gothic cathedral, you have seen the magic in action, all shimmery and golden. It’s stunning. 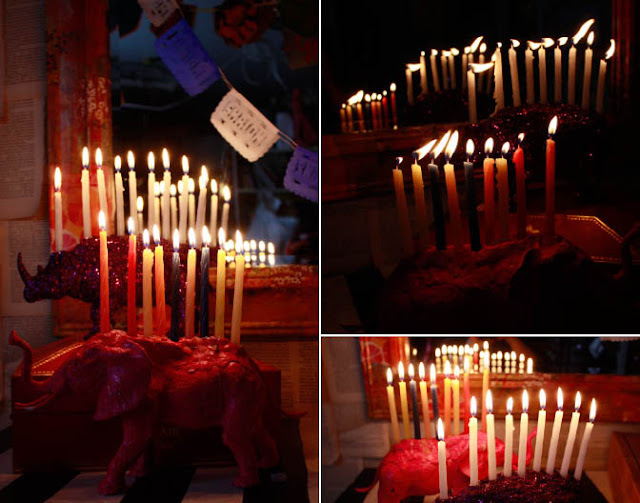 Switching gears from mass to menorahs….Years ago, I fell in love with a DIY menorah I saw in a magazine, assembled from candles in mercury glass votives. I rushed out to the store to pick up the votives, but then saw the price tag…. Seriously, who pays $24 for four sparkly shot glasses? The overpriced store in question (I won’t be rude and tell you the full name, but it started with Pottery and ended with Barn) also had some lovely golden votives and vases scattered around a harvest table. They interspersed berries and bark and earthenware style ceramics…a really lovely spread, I must say. Decided I liked the gold votives more than the mercury glass and set on home to make them myself. Two hours later, my golden modern day menorah was born. This is a great first-time project for those who have never tried it before. Messy bits and imperfections only add to the charm. Tip: If this is your first time and you will use it more than once, buy a kit that includes gold leaf, adhesive and varnish. They usually run around $10, depending on leaf quality. 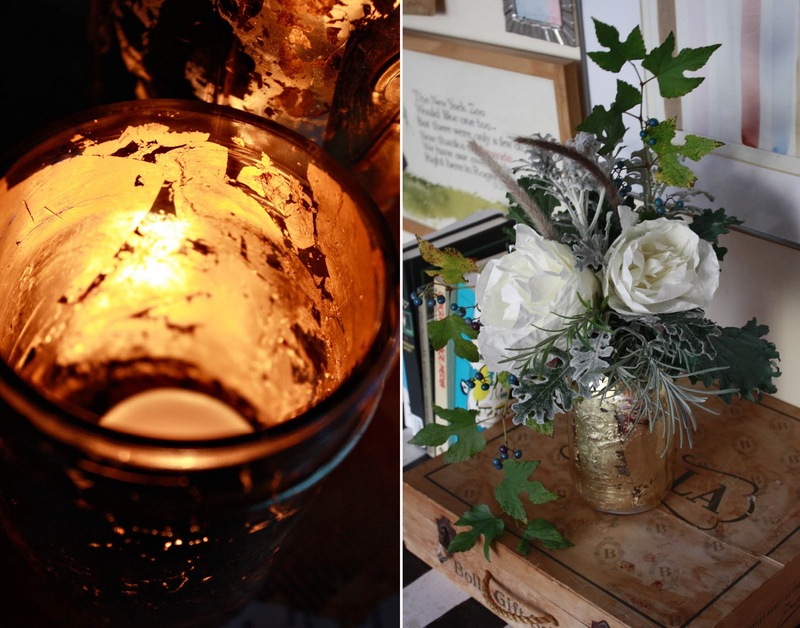 Tip: Gold leaf is very delicate. You will need to do this is a room without any wind/air flow. I would avoid working around small kids, at least the first time you try it. Tip: If you find that the gold leaf shreds when you touch it, that’s a sign your hands are too moist. Try picking it up with a paint brush, or put on cotton gloves. Tip: You still a scaridy cat? See this video for a quick and easy demonstration. Don’t be intimidated! 1. Line up your jars or glasses. Make sure they are absolutly clean. 2. 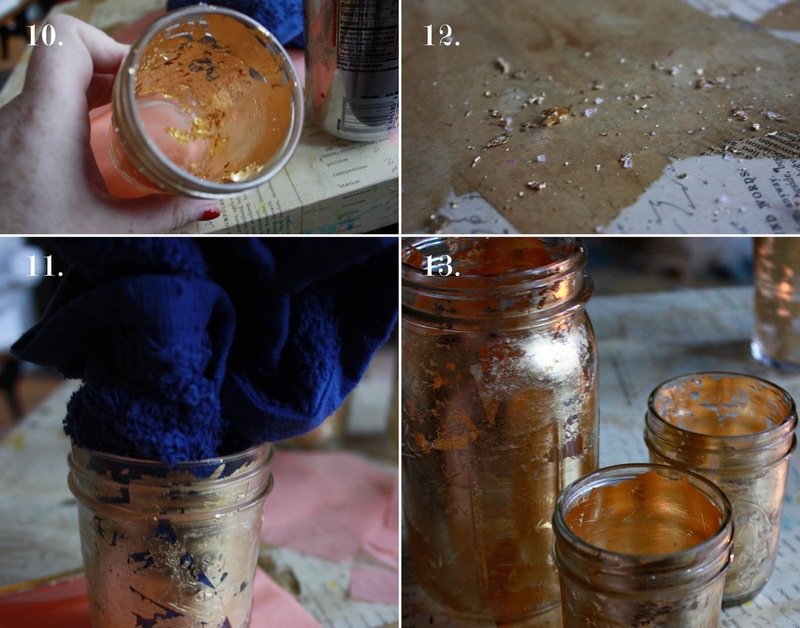 Apply gold leaf adhesive to the inside of the jar. 4. Follow adhesive directions, most will require the glue to dry for a while before proceeding further. 5.Tear 6 sheets of gold leaf AND the tissue paper away from the larger packet. 6. Smaller sheets are easier to work with, so I cut my sheets into quarters. You do what works for you. 7. Delicatly lift up one piece of gold leaf and tissue. Chances are it will still to the tissue and you won’t have to touch the gold much at all. If your hands are sweaty or there is a lot of moisture in teh air, wear cotton gloves or clap your hands with baby powder. 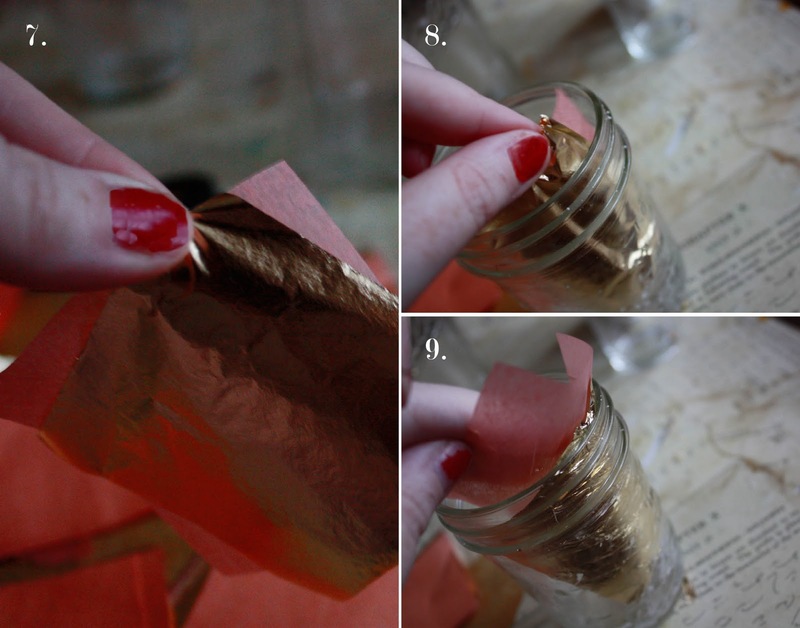 8.Insert the piece inside the jar, using the tissue to press the gold to the glass. move it around for a minute to make sure the gold sticks. 10. Repeat the process until you have covered the jar. Or not. You could just do one patch and that would be neato. You could just do the brim of the glass. Or not. Y’all decide. 11. Remove all the scraggler bits by inserting a rag or washcloth inside teh jar and swirling it around. This should wipe away most of the excess gold crumbs. If you decide there is too much gold, you can go in and scratch it away. 12. Gold crumbs can get kinda messy, so you may want to do step 11 outside, but don’t sweat it too much. Genuine gold crumbs are as dangerous as cracker crumbs. Except, somehow gold crumbs are a lot more fun to talk about. 13. Ta Da! You is a done one. 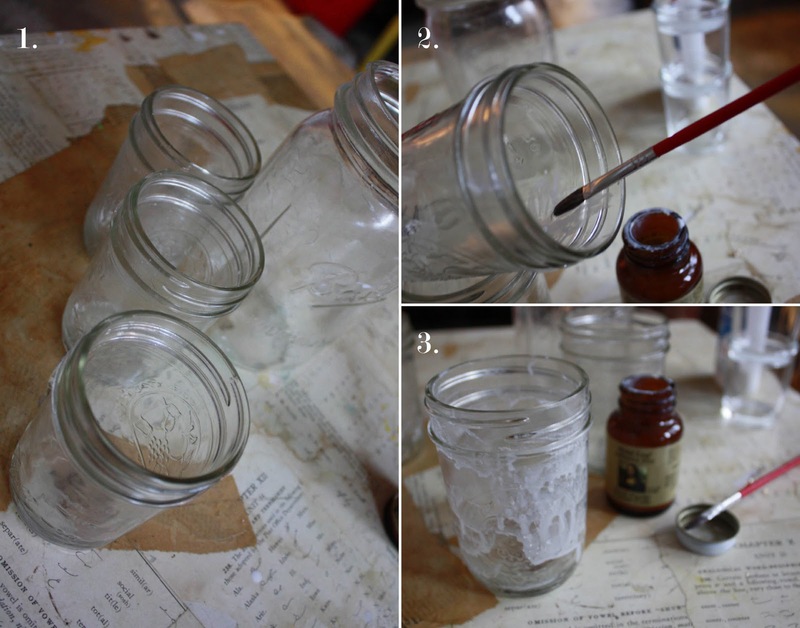 Feel free to varnish the inside, just make sure, if you are making votives, that the varnish is non flammable. A little diluted Mod Podge would do the trick. You could even tint the Mod Podge a color and make it look like colored glass. Folks, the fun never ends. Now let’s gild the lily! 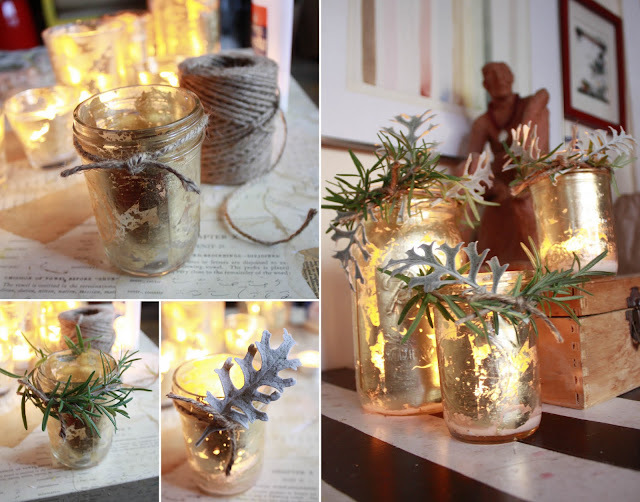 Tie a piece of simple jute twine around the rim of the jar, and tuck in some garden clippings. Did Y’all see this post of dusty miller on Design*Sponge…wow. I also love using rosemary around votives because the candle warm up the leaves slightly, filling the whole house with the most wonderful fragrance.Lavender is nice too. Just about any sturdy stemmed garden clipping will look good. I love mixing textures like this…the warm metallic gold against the cool velvety leaves…oooooo I could just swoon! Wouldn’t these make great gifts? You could gild baby food jars and pair with a few scented candles….or grab some garden trimmings (including these crazy turquoise berries) and a few cream colored roses and you have one stylish little nosegay to sit on top of someone special’s desk. Golden Happiness, one and all! Birthdays. Lots of them lately. Apparently I am drawn to Pisces. Who knew? Buttermints are those powdery, pastel colored candies that melt in your mouth. You used to see in a big bowl on the hostess table at restaurants, or, if you came over to Grandnana’s house, you would see little piles of them in cupcake liners all over the place…the coffee table, the end tables, the dining table, the breakfast table, the ledge in the hall, by the front door…even on the back of the toilet tank. Help Me Rhonda, how that woman loved her buttermints. She thought keeping them in a single candy bowl would breed germs, so she used little disposable cups instead. Not a bad idea, only problem was, Grandnanna was obsessive about everything matching. It would be a cold day in July before a blue cupcake liner made it into her pink kitchen. The woman refused to serve food with ketchup at the kitchen table because it clashed with the décor. I’m not even kidding. 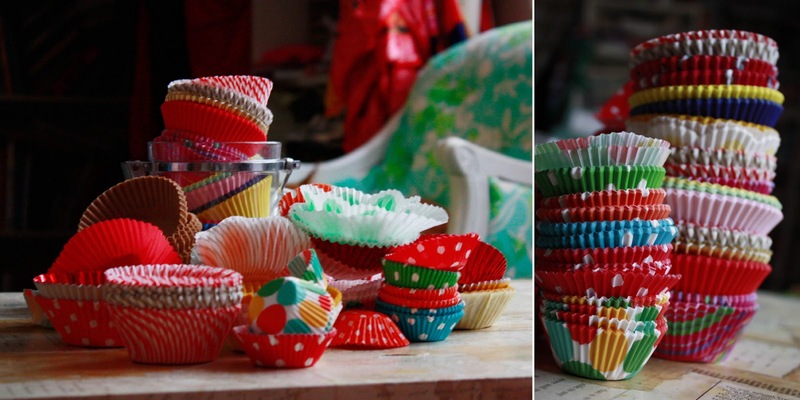 Needless to say, she always kept a variety of cupcake liners on hand. They didn’t make a lot of color/pattern options back then, so if you saw something nifty you just picked them up and saved them until Grandnanna’s birthday. She would get mad if you bought her a real gift, but simple indulgences like cupcake liners and heavy duty aluminum foil were greatly appreciated. Ramble Ramble Ramble…because I inherited every breed of crazy from Grandnanna, it’s only natural I also inhereted some of her cupcake liners and started a collection on my own. Eventually the collection got so big I had to curb it by setting a $1.00 a packet limit on all new acquisitions. Of course, wouldn’t you know it, the fancy department store down the street, the one with the great kitchenware departments where I’m always buying registry gifts, is always selling cupcake liners on clearance and they are always priced 89cents. Polka dots, checks, and stripes…it’s different every time. I can never pass them up. One time, I passed up on buying some Laura Ashley style pink pansy print cupcake liners, and I swear to you, an hour later I was craving buttermints so bad I had to take two buses to get to a greasy-spoon diner where they keep them at the hostess stand. Making these is so easy. Just grab a lunch sac, some twine, hot glue, and of course, cupcake liners! 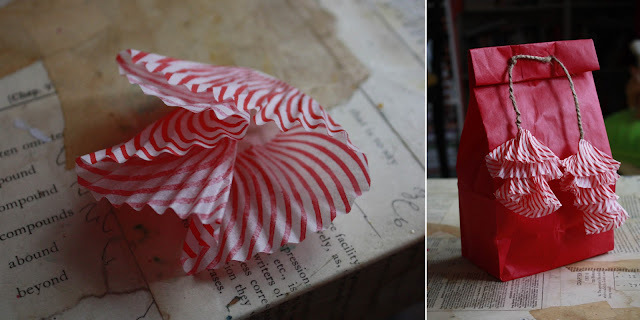 I make bag handles just by gluing the twine to the inside of the bag. This is gift wrap y’all, no need for long term quality here. If you want to be thorough about things, use an existing shopping bag like the white one above. Whatever you do, don’t just go out and buy a gift bag! True Craftmeisters never buy bags or ribbon. It’s the law, y’all. 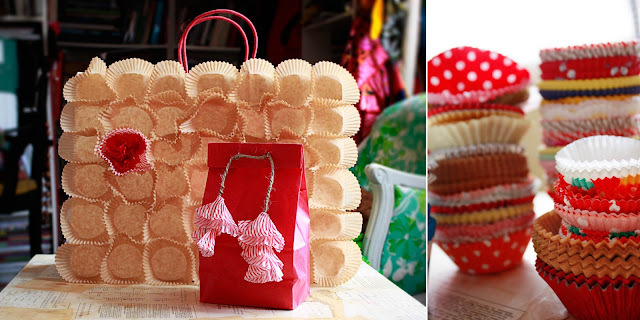 Ruffles work wonders! Just pinch a cupcake liner or two and hot glue to end of some rustic old twine. Ta Da! 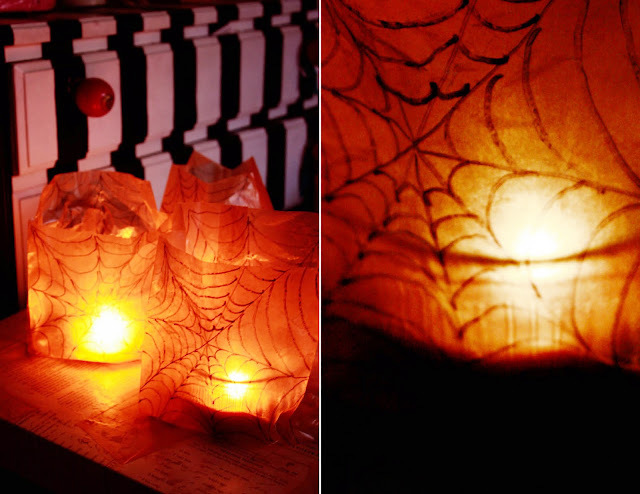 Not much time for Halloween hoopla this year, a few festive luminaries go a long way! 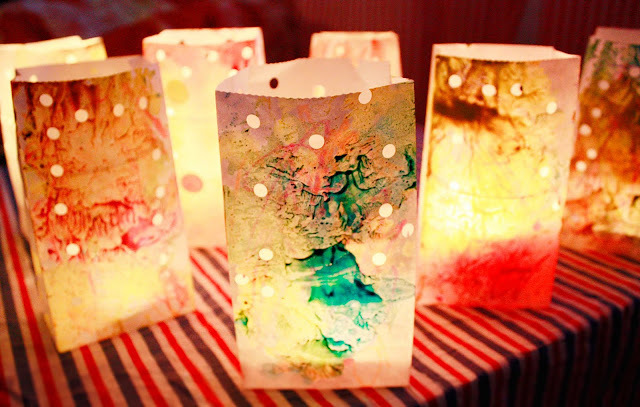 Luminaries are so good at creating atmosphere, especially now that the days are getting dark and chilly. 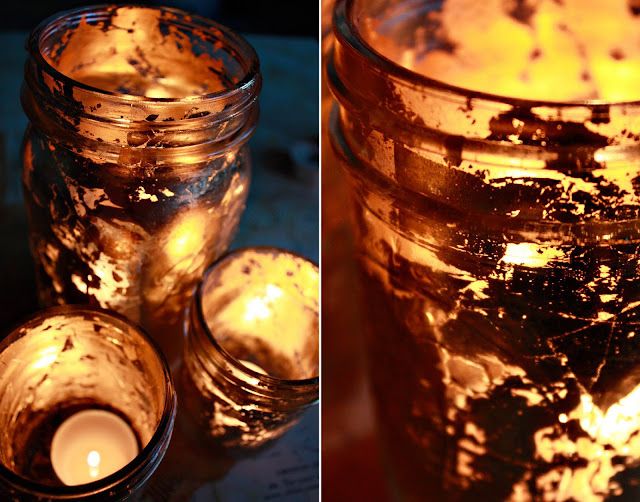 Candlelight alone is lovely, but candlelight glowing through crumpled wax paper bags is really something to be seen! The effect is almost like an old parchment paper lamp shade, but cheaper, prettier, and slightly spooky. 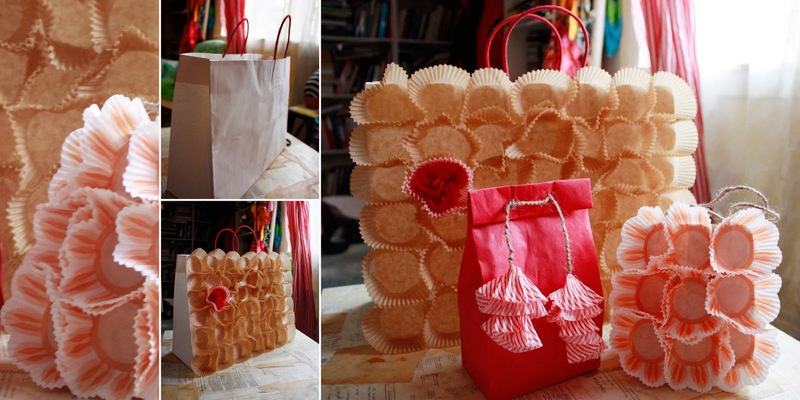 Tangent: Wax paper bags are amazing. They are great for wrapping gifts and organizing odds and ends like photos, receipts, and paper scraps. I like to use them to pack a snack and seal it with a ninja turtle sticker. And no, I don’t have children. And yes, I keep a giant roll of Teenage Mutant Ninja Turtle stickers around the house. What? Don’t look at me that way. I enjoy a well packaged snack. Everything tastes better with ninja turtles. Also, wax paper bags are far more Earth-friendly than plastic baggies, and significantly cheaper when you buy them in bulk. For smaller quantities, you can find them at the grocery store, usually down on the bottom shelf. Y’all have to try them out! To draw the spider web, just get yourself a permanent marker and go to town. I’m guessing that if you are reading a blog like this, you are probably comfortable with drawing a spider web, but just incase, I did a demo for you just like Mrs. DuCharm showed me back in the day. Just make a cris-cross and loopty-loo each segment. That’s right, loopty-loo I said. We are keeping it technical today. And there it is! Make a bazillion of these and cover your house with them on Halloween night –a sure fire way to scare the kiddos! Trick-or-Treat, smell my feet…for anyone in the mood for two minutes of literary candy, read “Haloween: A Love Story” by Rodes Fishburne. A personal favorite. This last week has been a beehive of events and activities, severely marred by a flu bug that will not go away. Shoo flu, shoo! I have things to do! 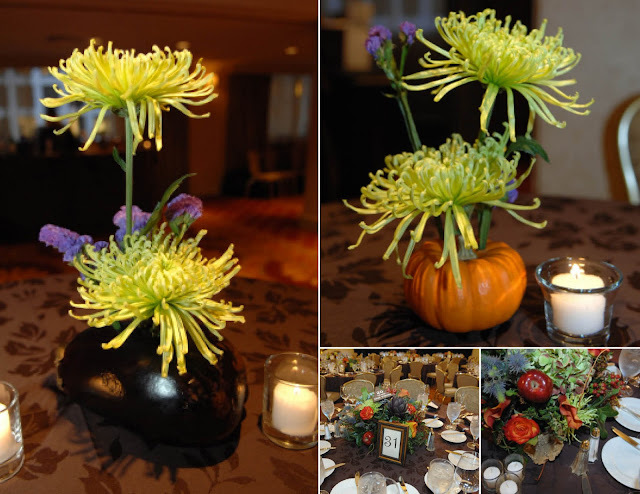 Until I get back in the swing of things, wanted to share this little arrangement from a autumnal charity event. There were some beautiful, traditional style centerpiece arrangements on the tables, but we wanted add a special touch to the cocktail and accent tables. Problem: no budget. Solution: grocery store gourds! These are so simple, easy, cheap, and elegant, fast, FUN, and to think you can get all the materials in the produce section! No tutorial needed on these. Just drill 3-5 holes in the top of the gourd and insert the blossoms of your choice (drills are faster if you are making a bunch of these, but hammer and nail work fine too). Gourds and veggies like baby pumpkins, squash, apples, pear and eggplants work just great as the base, paired with hardy flowers like status, mums, roses, and dahlias. More delicate flowers like lilies and peonies will also work, but they fade faster. The flowers will extract water from the inside of the fruit/vegetable, slowly but surely, certainly long enough to keep them alive and kicking 12 hours or more. I took an eggplant home and it lasted for 3 days! If you don’t want to bother with flowers, you could grab supplies from the side of the road –what about a few stalks of feathery wheat with some pussywillow twigs, or a magnolia leaf? Or what about adding a guinea fowl feather, or a cluster of acorns? The possibilities are endless! These were used as cocktail table accents, but can you imagine ten of these lined up down the middle of a long table? Or used at each place setting around a harvest or thanksgiving style spread? 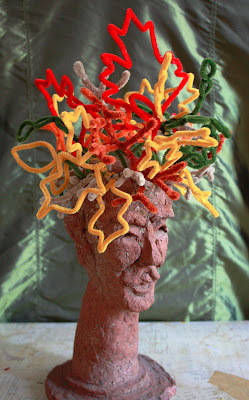 Pipe Cleaner Crowns: Heck Yeah! Internet: meet Bernadette. If y’all were neighbors (lovely thought) you would know her already. She sits in my window all year round, never changing her gaze or location. The one thing that does change is her head gear. In fact, it changes all the time. Bernadette is kind of like those plastic geese with the seasonal costumes that were so popular a few years ago. Whatever happened to those geese anyway? I haven’t seen one in ages…. Like Lola, Bernadette loves her hats; snow caps and earmuffs for the winter, delicate vintage hats and Easter bonnets in the spring, sunglasses and visors in the summer, not to mention birthday part hats, witches hats, Statue of Liberty tiaras, etc.. Come fall, she is all about leaves. Last year’s leaves were paper, this year it’s pipe cleaners! I have been just crazy about pipe cleaners since this ring craft at my BFF’s bridal shower. It has trickled into every corner of my life. Y’all will have to wait and see the turkey extravaganza I’m planning come November. This is a great craft for kids: quick results, zero mess, and a great addition to any dress-up cupboard. 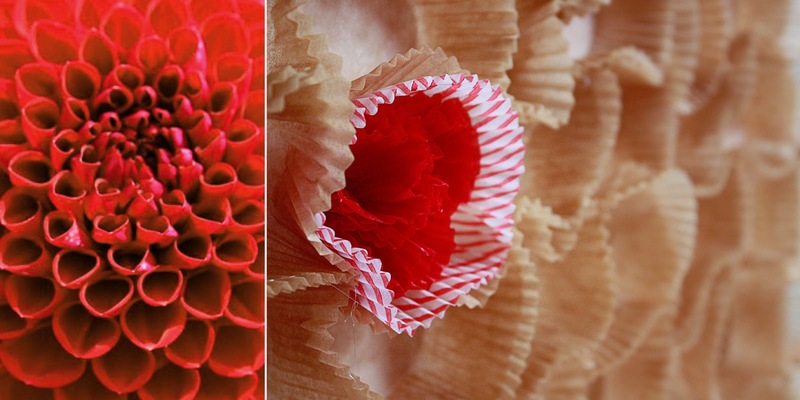 Pipe cleaners are such a flexible material (no pun intended). You can make all kinds of goodies with them, but I think crowns and tiaras are a great place to start. There are thousands of variations on these, but I’ll show you a basic crown and let you take it from there. The sky is the limit! Note: From here on in, when you read “twist” I mean twist the pipe cleaners together so they are jointed together. Test your joint with a swift tug. For me, this means physically twisting them around at least twice. For children, or those with a delicate touch, three or four times might be better. You decide for yourself. 1. Use two green pipe cleaners to form a circle around your head. 2. Twist loose ends smoothly around the circle. 3. Twist the end of one orange pipe cleaner to your circle. 4. Slide two straws on the orange pipe cleaner. 6. Slide the straws to the base of the circle leaving a loop of exposed pipe cleaner at the top. 7. Twist the exposed orange pipe cleaner, forming a loop. 8. Repeat steps 3-7 until you cover the entire green circle. 9. After pushing up the orange loops, you will essentially have a crown. Yay! you can stop now, or, add some reinforcement with a second set of triangles running all the way around (highly suggest taking this step if kids plan to play with the crown more than once). start by attaching a red pipe cleaner to the green circle, making sure the joint is halfway between two straws. 10. Identify the “halfway point” on your red pipe cleaner (by bending it) and twist to attach to the green circle, exactly half way in-between the next set of straws, weaving it in-between the straws as you go. The weaving really helps to reinforce the crown shape. Repeat all the way around. 11. To turn loops into triangles, just pinch. …oh the places you will go! Be sure to check out these matching rings.